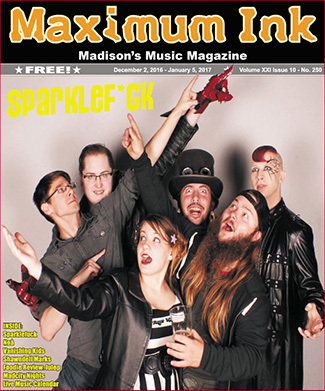 With quirky songs about murder and mayhem, Madison’s SPARKLEFUCK is all about a punky and poppy sound about taboo topics and a ridiculous stage show. Male and female vocals collide with circus keyboards and aggressive bass to cultivate an unconventional sound that’s undeniably fun. While the band stopped playing regularly in 2015, they’re reuniting for a special pre-New Years party at The Frequency on December 30th. We talked with the whole band, including vocalists Sascha Strange and Susan Galasso, guitarist Kyle Jaco, and bassist Ryan Schremp. Maximum Ink: What made you guys want to be musicians? Ryan Schremp: My mom was a professional musician while I was growing up and she tried to get me to learn piano when I was 3. That didn’t take, and it took local musician David Natvig from BURIAL OF AN ERA to introduce me to bass guitar when we were 10. Sascha Strange: Music has always been at my heart. I fell in love with the boundlessness of expression that can be communicated through music younger than I can recall, and throughout my life it has remained my passion, my solace and my ecstasy. Susan Galasso Seleen: I come from a family of musicians and have been singing about since I could talk. It’s one of my favorite ways to engage with people. Before SPARKLEFUCK, all of my experience was in classical choral and solo singing, and the opportunity to make music with some of my closest friends was what got me into the band. MI: What do you love about rock music? Ryan Schremp: It feels like home. Sascha Strange: I am absolutely intoxicated by the transcendent beauty borne out of the chaos, driving intensity and raw feral exaltation unleashed by rock and roll. I revel in becoming a channel for the sheer, undeniable power and ferocity of it. Susan Galasso Seleen: The spontaneity and exuberance. Coming from the perfectionism of classical performance, it was really difficult for me to be comfortable onstage at first, but being able to feed into and off of the crowd’s energy and go with the flow is really fantastic. Those moments where you can close your eyes and feel like you’re riding this huge swell of sound. Kyle Jaco: I’m just in it to piss off my parents. And make my grandparents proud. MI: What would you recommend as the song to listen to for people who are listening to SPARKLEFUCK for the first time? Sascha Strange: “King In Yellow”, “Murdercastle”, “Killer Smile”, “The Master”... I’m very proud of our canon in general. The recordings don’t do us proper justice, though, you really just have to come to the show. Susan Galasso Seleen: “Murdercastle” is probably the quintessential SPARKLEFUCK intro. It’s got a lot of our signatures: spoken word, 3-part vocal harmonies, lots of keyboard, really upbeat music about really dark subject matter. It’s about H. H. Holmes, the serial killer that inspired “Devil in the White City”. MI: It’s an interesting band name, what’s the story behind it? Sascha Strange: The name SPARKLEFUCK existed as an ephemeral abstract, a pure form without reflection in the world, glittering colorful and bright in the darkness, elusive as dreams themselves. Onieromantic expeditions into uncharted territories of Nod revealed its trail and, despite the dangers inherent traversing the formless wyld, once we had the scent our pursuit was relentless and inevitable. At the jagged edge of oblivion where memories and ideas slip away we captured and consumed it. Infused in our very being, we returned to show the world the strange and wondrous thing that was SPARKLEFUCK. MI: So how are you guys going to finish off 2016? What’s the show going to be like? Sascha Strange: Lovely melodies, great stories, and live human sacrifice - you know, a well rounded evening. We deliver sweet three part harmonies and deliciously catchy, sing-along tunes amplified with merciless, unstoppable exuberance as we regale you with tales of murders most foul, unspeakable brutality, and horrible monsters. Watch our makeup melt off our faces as we pour every last mote of our souls out on stage. Feel our mighty anima manifest once more at this rare and unlikely engagement, and join in our day-glo, glitter-gilded celebration of the darkest nights before the new year and the looming Age of Chaos.